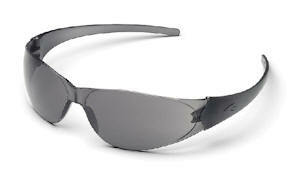 Triwear's lens offering a 180 º optically correct viewing area is this Pro Grade style's most innovative feature. A contoured frame and sleek design combine to offer an eye-catching style that meets ANSI Z87+ safety requirements. 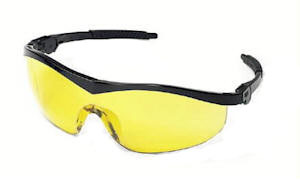 MCR Safety's Professional Grade eyewear is engineered to provide the highest level of innovation for consumers that demand the very best in safety. 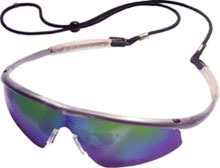 •The Medallion Collection can resolve complaints of headache and provide 180 degrees of clear vision. 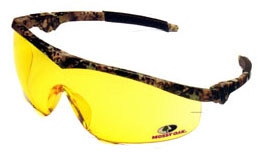 Crews is the exclusive safety eyewear distrubutor of Mossy Oak brand camo. Mossy Oak is a registered trademark of Haas Outdoors, Inc and is used with permission. •Ratchet-action temples combined with non-slip rubber head-grips create a customized fit for virtually any head size. •Wrap-around lens constructed of lightweight, scratch-resistant polycarbonate delivers advance visual acuity and protection. 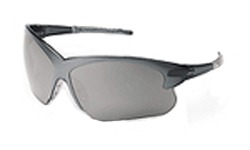 •Meets the ANSI Z87.1 standard for optical clarity and impact resistance. •Product meets ANSI Z87.1-1989 Safety Standards. Some of the items in this style also meet European CE (EN166) and Australian (AS/NZS1337) Safety Standards. The super-lightweight CheckMate® provides near total eye orbital seal and features flexible bayonet temples and universal nosebridge, ensuring compliance and comfort for a variety of wearers. The Klondike® Series from CREWS® features safety and style at an affrordable price to separate you from the pack. Whether on the slopes or in the workplace, Klondike's matte black frame finish, adjustable temples, 11 degree base curve lens and proprietary gel nose piece keeps you at the peak of comfort and style all day long. The coolest look in eye protection just got an icy new look. The Frostbite 2® from Crews now a frosted frame, taking safety and style to a higher power. All Frostbite 2 lenses are scratch-resistant and filter out 99.9 percent of UV radiation. Treated with exclusive Duramass R scratch-resistant coating. All items shown meet ANSI Z87.1-1989 Safety Standards. This single wrap-around lens design with integral sideshields offers durable metal alloy temples with non-slip rubber head-grips for a customized fit. The strong yet durable lightweight polycarbonate lens is available in four tints, including an indoor outdoor lens. 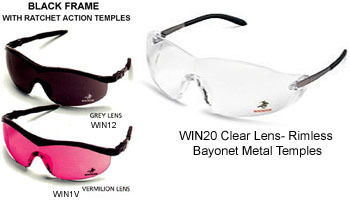 Each with the distinctive Winchester® logo ... all 100% focused on safety. 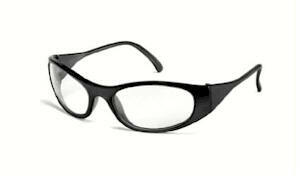 •Synthetic rubber nosepiece and temple sleeves provides a soft comfortable fit.